Tensions are always high at the highly anticipated Sugar Bowl football game and this year even the college mascots joined the fight. The University of Texas mascot Bevo XV the bull was meant to pose for pictures with opponent Uga X the bulldog from the University of Georgia on Sunday at the Mercedes-Benz Superdome in New Orleans. 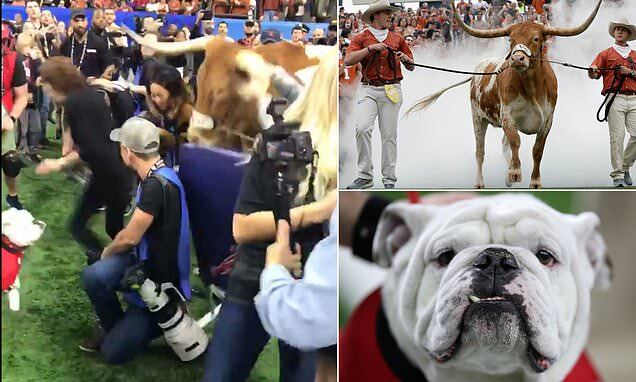 But the feisty 1,600-pound bull quickly got heated and charged towards the tiny bulldog on the field, throwing photographers out of the way. The animals were brought onto the pitch with their handlers for a photo-op before things turned awry. Shocking video from the scene sees the bull throw up its pointed and long horns at a crowd of reporters and photographers with its eyes locked on the tiny dog sporting a red Georgia sweater. The bull’s handler is seen trying to hold onto its horns and struggles to control the animal as the giant steer charges forward.